Lay out the puff pastry sheet flat. Cut it into thirds vertically and then horizontally so you have 9 equal squares. In a medium mixing bowl, add in the jalapenos, bacon, pepper jack and cheddar cheese, and cream cheese, Wood it with a wooden spoon until the cream cheese is thoroughly incorporated. You want the cream cheese to act as a binder for the other cheeses, jalapenos, and bacon. Add the egg into a small bowl with 2 tsp. water. Whisk with a fork to combine. Brush the egg wash on top of the puff pastry squares. 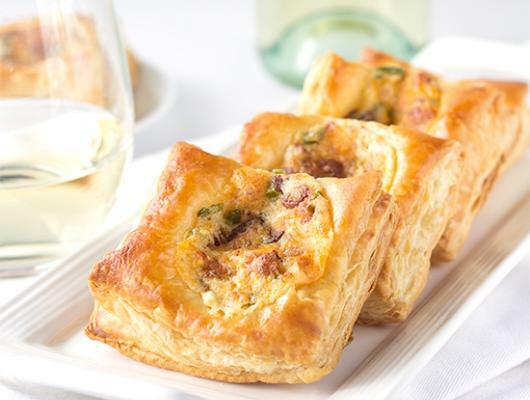 Add 1 tablespoon of the jalapeno popper filling to the center of the puff pastry. I rolled mine into a ball and placed it into the center of the pastry. Place into the oven and bake for 18 minutes until the edges are golden brown. 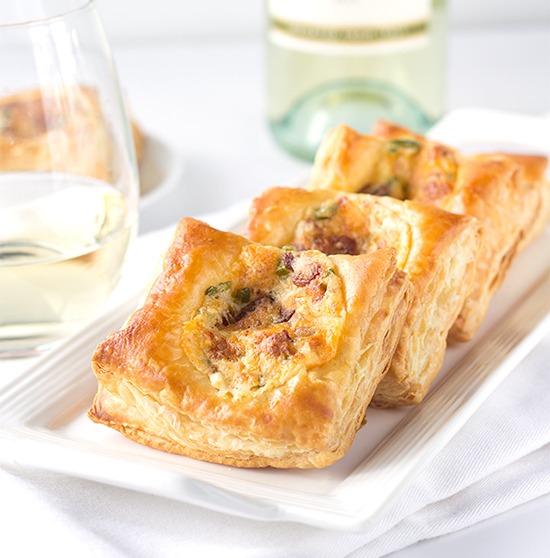 Jalapeno Popper Bites - a delicious appetizer with golden puff pastry loaded with jalapenos, pepper jack and cheddar cheese, and loads of bacon.